“Selected historical sculptures by Niki de Saint Phalle are on view at the Nohra Haime Gallery from August 2 through August 29, 2012. The exhibition includes Dawn, one of her signature and richly colored Nanas, along with her mystical figures, Double Tête and Horus et Sa Grace. Two examples of Saint Phalle’s furniture, such as Clarice Chaise Femme and Charly, also are featured. Providing a distinct and more intimate look into the artist’s ambitious and inventive work, this exhibition runs in conjunction with Niki de Saint Phalle on Park Avenue, a major site-specific installation including nine monumental sculptures standing along Park Avenue from 52nd to 60th Streets.” Read more. 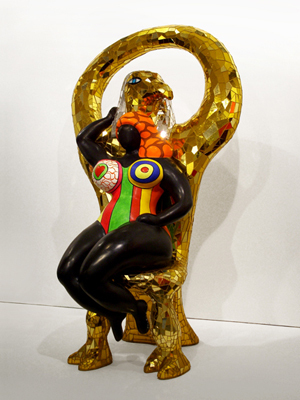 Pictured: Niki de Saint Phalle’s Horus et sa grace at Nohra Haime Gallery in New York City. Photo by Laura Maloney. 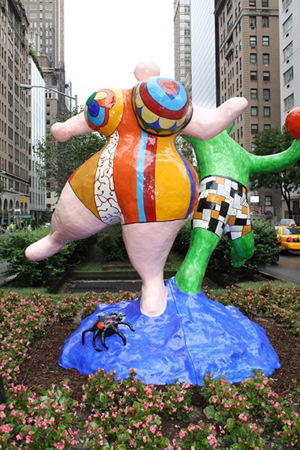 “Marking the 10-year anniversary of Niki de Saint Phalle’s death, an installation of her curvy, joyful women dance along Park Avenue. The sculptures, created out of polyester resin, some with mosaics of ceramic and glass, memorialize the achievement of the French artist whose work incorporates a joie de vivre as big as a New York summer. The vibrant women meld perfectly with all the color surrounding them on the iconic avenue  vibrant sundresses, the perfect summer blue sky, men’s rainbow ties. “Les Baigneurs starts the exhibition, which runs down from 60th Street and encompasses nine pieces including works from her tribute to jazz musicians, such as Louis Armstrong and Miles Davis, and her Grand Step Totem.” Read more. Pictured above: Niki de Saint Phalle’s Les Baigneurs (The Bathers) on Park Avenue in New York City. Photo by Kelsey Savage. An online catalogue raisonné of the “Nanas” of Niki de Saint Phalle is scheduled for publication in October 2014. Niki de Saint Phalle created a large number of Nanas in the course of her career, made using various materials and with diverse shapes and dimensions. The catalogue raisonné will document this aspect of Niki de Saint Phalle’s oeuvre and illustrate the range of her creative achievements in this area. The catalogue raisonné of Niki de Saint Phalle’s Nanas aims to be a comprehensive publication that will reproduce and list all known works of this kind. It will establish as definitive an inventory as possible of Niki de Saint Phalle’s authenticated Nanas. We would be very grateful for any information we might receive from private and public collectors who wish to propose Nanas for inclusion in the catalogue raisonné. Please complete the online form or contact us by email at nanacatalogue@gmail.com. While we hope you will be able to supply as many details as possible to enhance the accuracy of our research, we understand that some information may be sensitive, personal, or private. Please be assured that all information provided will be treated in the strictest confidentiality. All requests for anonymity will be fully respected. We thank you in advance for your time and your support for this project.